For thousands of years the scent of patchouli oil has captivated people all over the world: we just can’t help but be drawn to its wonderfully earthy, lightly floral aroma with just a touch of sweet, spicy undertones. Its air of mystique and mystery is undeniable, and now Silver Linings Lavender has expertly paired the exotic essence of patchouli oil with the soft, efflorescent undertones of pure lavender essential oil— for an entrancingly intoxicating self-care experience. The ritual begins with the luxurious lather of our all natural Lavender Patchouli Soap bar. Feel your mood lift and tensions ease as the enticing fragrance envelopes your body and fills your senses. 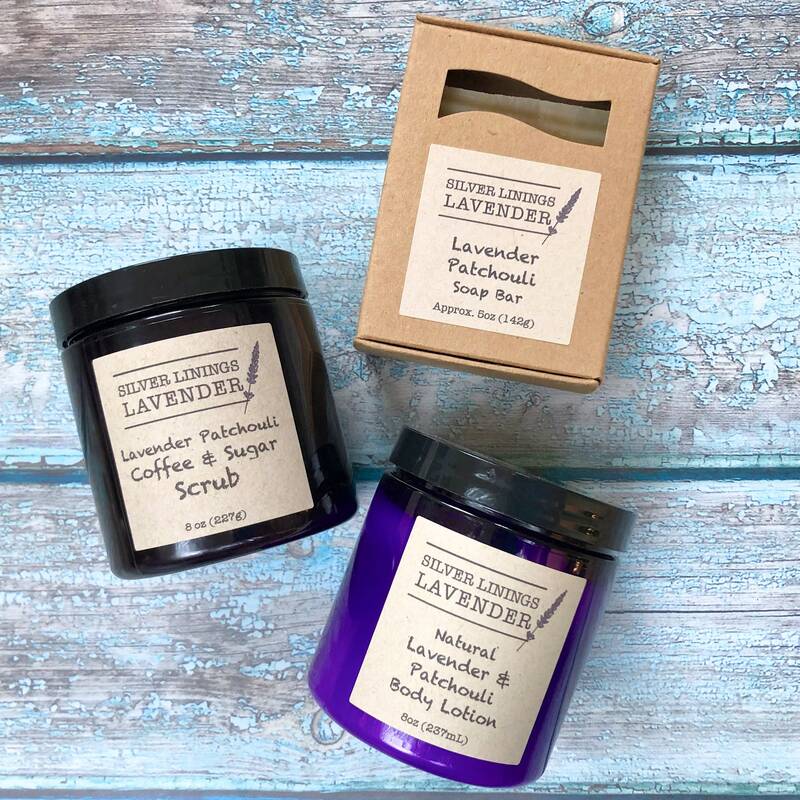 The experience deepens with our Lavender Patchouli Coffee Sugar Scrub; the gentle exfoliation of its all-natural ingredients returning a supple youthfulness to the body, and calm to the mind. Finally, relish in the velvety texture of our Lavender Patchouli Lotion as it glides over your skin; providing the nourishment it craves with its careful combination of the finest butters and oils Nature has to offer. Whether you’re shopping for yourself or a dear loved one— give the gift of irresistible allure with our carefully curated Lavender Patchouli Gift Set.